"This is ants on a log... on a bagel! All the things on top signify the forest animals. A healthy after-school treat that will make the kids smile and jump for joy." Toast bagel in a toaster until golden, 3 to 5 minutes. 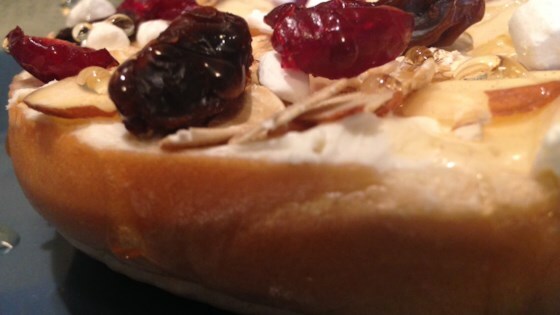 Spread cream cheese onto the bagel; top with marshmallows, oats, almonds, raisins, and cranberries. Drizzle with honey. A towering treat of cherry chocolate pancakes! Any nut can be substituted for the almonds.